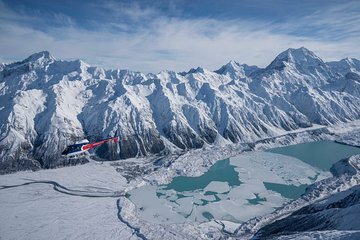 Experience the thrill of a helicopter flight and snow landing on a 20-minute scenic helicopter tour, departing from Mt Cook township. You’ll get sweeping views over the Ben Ohau Range in the Canterbury region before touching down on a landing site in a snowfield high in the mountains. Enjoy this South Island alpine setting as your professional pilot narrates the vista, including Lake Pukaki, from above. Este voo panorâmico de 20 minutos varre as paisagens escarpadas da região de Ben Ohau, incluindo um breve pouso na neve. Após o embarque no hotel, você é transferido para a base de helicópteros na vila de Mt Cook, onde embarcará em um helicóptero bimotor com capacidade para até seis passageiros. Contemple os picos das montanhas que cercam os vales da região de Canterbury, esculpidos por geleiras séculos atrás. Veja as águas glaciais do Lago Pukaki de cima, e olhe para o norte para ver o distante Aoraki / Mt Cook, a montanha mais alta da Nova Zelândia, que se eleva a 3.724 metros acima do nível do mar no parque nacional da UNESCO. Ouça enquanto seu piloto envia comentários especializados a caminho de um dos picos das montanhas, onde você experimentará um pouso suave em um campo de neve. Depois de algumas fotos fantásticas, você voltará para a base do tour para um traslado de volta ao seu hotel. Fabulous tour. Highly recommend this. Excellent friendly staff, flight of a lifetime! This helicopter flight was fantastic - we thoroughly enjoyed this tour. The staff were very friendly and were able to fit the flight within our schedule, despite the morning fog. I would highly recommend going on this tour while in Mount Cook. This was one of the highlights of our trip. The scenery on the short helicopter ride was spectacular. There were longer and more expensive options, but we found that the short ride was long enough. The view was very good, unfortunately the photo session was too short (not more than 10 minutes) and allowed at 1 spot only. Re-booking our flight to a later date was no problem at all. Friendly service and a flight experience that I definitely recommend to anyone keen to see some spectacular views. This trip was very good.